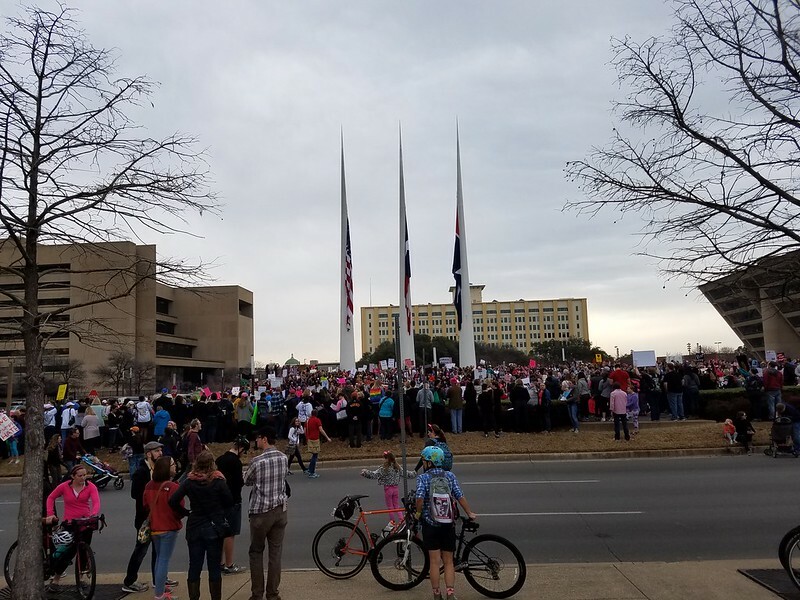 Women’s March in Dallas – Photos and Videos and What Does a March Do? The march tells us we are not alone – other people have the same concerns and fears, and are frustrated that they haven’t been heard. When you know that you aren’t alone, you can take action in other ways – why write your congressperson if you think that your letter will be a single one pertaining to one concern? When you know that others feel the same way it is easier to write a letter with the faith that yours will combine with others amplifying the sentiment. It lets us exchange ideas. It lets us say that we believe we matter and are willing to stand up for that. It lets us say to other people and other groups that they matter, that we will not quietly ignore unfairness towards them. It lets anyone who chooses to look out the window or read the news know that thousands of people went out to say something, that thousands of voices aren’t ready to be silent. This can be seen by those not yet ready to speak out, those feeling alone or left behind. It can also be seen by those who have been elevated to power, if they have the sense to look.